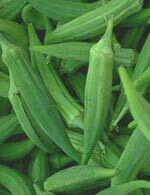 When cooked, okra exudes a slimy substance, which serves as a wonderful thickener in stews. Arugula, also known as salad rocket, is one of the popular Mediterranean green leafy vegetables. Red and yellow peppers are riper, more flavorful, and pricier than the more common green ones. This mild-flavored squash looks like a wrinkled, pale green pear. 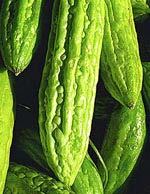 This variety of luffa gourd is cultivated for the tender and sweet flavor of its immature fruits. This edible flower is sold before the buds open. Cilantro leaves are used throughout the world as a fragrant herb. Hispanic cooks use it in salsas, Asians in stir-fries, and Indians in curries. This sweet and mild squash has a fuzzy feel to it. With its sweet yet pungent flavor, ginger has become a mainstay of many of the world's cuisines. European cooks like to use dried, ground ginger to flavor gingerbread and other baked goods. Asian and Indian cooks prefer their ginger fresh, and they use it in spicy sauces and stir-fries. Ginger not only tastes good, it's also believed to have medicinal properties, and people sometimes use it to soothe their upset stomachs and boost their energy. The Indian variety of the bitter melon has a very rough appearing skin and is known for its bitter flavor. 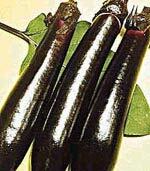 A variety of eggplant characterized by their large oval shape and brighter purple coloring. The Chu-Chu hybrid is the most desirable variety for gardens and eating. They are similar in flavor to the Asian or American eggplants and can be substituted if necessary for the other varieties. Similar to the Chinese Eggplant, but with a darker skin and a more bitter taste. These large, mild chiles are perfect for chiles rellenos. Mexican cooks also like to dice or pur�e them, and then add them to sauces, soups, and casseroles. 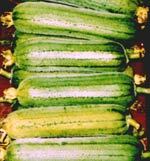 A longer variety of the fuzzy squash. This cross between an English pea and a snow pea is sweet and crisp, and is eaten whole, pod and all. Sugar snaps can be served raw, briefly stir-fried, pickled, or steamed as a side dish. You eat these whole, pod and all. They're often stir-fried very briefly (no more than a minute), but they're also good raw. They're easy to prepare, just wash and trim the ends. This is the same as the red pepper, however it is not ripe. 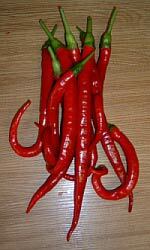 This very hot pepper can be cooked or dried and ground and used as a condiment. This tomato shaped eggplant is used extensively in many Asian foods and have appeared in many Oriental supermarkets on the West Coast. 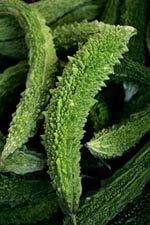 This sweet, crunchy okra can be used as a salad or cereal topping. Watercress/Cresson is a rapidly growing green leaf. 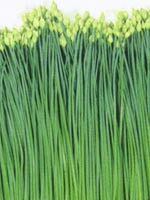 It grows in the water, is a perennial plant native to Europe and Asia and one of the oldest known leaf vegetables. America's most popular summer squash, zucchini can be served raw, saut�ed, baked, grilled, and even shredded and baked in a cake.